Mayor Byron Brown says his administration continues to focus on building strong bonds between police and residents and trying to keep neighborhoods safe. “We want to get illegal guns off the streets of this community, and those guns have been used to take lives of members of our community, and we want to band together as a community to stop that,” Brown said at City Hall. Buffalo police have removed nearly 15,000 guns since 2006 and crime in the city has dropped by more than 32% since 2005. Brown says in the first four months of 2016, there has been a 50% increase in confiscated handguns. June is National Gun Violence Awareness Month. 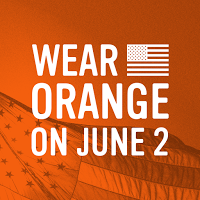 Residents are urged to participate by wearing orange, the official color of gun violence awareness, and share pictures on social media with hashtag #WearOrange. The color orange is said to symbolize the value of human life, such as when hunters wear orange in the woods to protect themselves. Vicki Ross, Executive Director of the Western New York Peace Center, emphasized the need to get guns off the streets. “We, in this country, are at war on ourselves when we have more people who have died in gun violence on our soil than we have had people killed in wars overseas,” Ross said. In honor of the movement, the City Hall dome will be illuminated orange Thursday night.